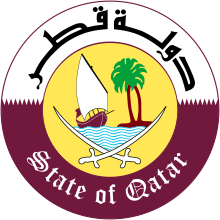 The emblem o Qatar (Arabic: شعار قطر‎) shaw twa crossed white bent swords in a yellae circle. Atween the swords thare is a sailin ship (dhow) sailin on blue an white waves aside an island wi twa palm trees. The circle is surroondit bi a roond doughnut-shaped object, which is dividit horizontally. In the white section the name o the state o Qatar is written in maroon Kufi writin an in the broun section, the Inglis translation (State O Qatar) is written in white writin. The coat o airms is whiles shawn athoot the Inglis translation, the middle circle is occasionally yellae an the bent swords are whiles broun (insteid o white). The current version wis introduced in 1976 an replaced anither ane, which wis uised syne 1966, an consistit o twa bent swords, ane pearl shell an twa palm tree-branches wi the label "Qatar". Several elements o the emblem are featurt in naitional emblems o several Middle Eastren kintras: the traditional Arab bent swuird is an aa present in the coats o airms o Saudi Arabie an Oman; the dhow is in the coat o airms o Kuwait an the umwhile coat o airms o the United Arab Emirates. The palm tree is an' a' a naitional seembol o Saudi Arabie. The colours an the separation o the ootside ring come frae the banner o Qatar.